After my last post about virtual races - I started thinking that I should do a master list of virtual races. To me there seems to be more of them at this time of year, or I could be delusional. Probably the later, since I feel like I'm on overdrive right now. My college friend, Leslie and her running buddy have created a facebook community you definitely need to check out. It was Leslie's goal to run a half marathon each month this year and she was having a hard time finding one for month of December. Their solution? Can't find one - create one! Now that was easy. And what's even better, you don't have to travel or be at a race at a certain time. They've created a few races on their page. 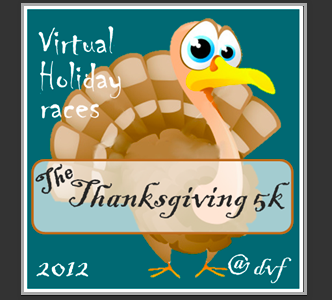 Right now they have a Virtual Thanksgiving 5k on 11/22, a Virtual Frigid Half Marathon on 12/2 and 2013 New Years Day Virtual Race. All you have to do is like Kickin' Asphalt on facebook, run your race and then go back and record your time. Super easy. Tell Leslie & Christine I sent you! Cortney and her husband lost their daughter, Ashlyn, in 2008 to stillbirth and her family has worked hard to move past the pain. Check out her blog to read about her journey. 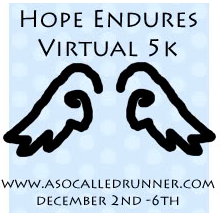 From the website "This is a virtual 5k that is not about winning or prizes, it is for anyone who has to edure life after something they think they can't. It's about just enduring life each day when we are down. It's a celebration of change and a celebration of never-ending love." You can sign up for this race here. If you need an extra little push to get out the door for a run and cool prizes are your motivation - you should check out Kiley's Thanksgiving Virtual 5k. Remember to take a picture of you with your bib # & be sure to run around town with your bib # on as well so everyone knows you're racing that day! Amy and her running friend went out for a run and Amy was hit and killed by a car. Even more sad, she left behind a daughter who isn't quite 2 years old yet and a husband. This race hits me hard because this could be me or anyone of us. Scary. "November is Epilepsy Awareness month. Wear purple and show your support by participating in this virtual race. Run or walk a 5K or a marathon or any distance you can to show your support to raise awareness and help find a cure for epilepsy. The event runs the entire month of November so you can run at your own time and pace. You can run it all at once or add up your miles throughout the month. Run on a treadmill or outdoors, anywhere you want. Any age can participate; include the whole family!" 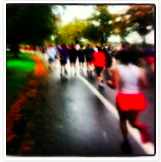 A blogger friend of mine, Jamie, is a running mom, who also epileptic. Read her story here. She is an incredible motivator. I am running this race for Jamie, her family, and every single person affected by epilepsy. Louise is hosting a Lobstah Virtual Run - you choose the distance - to raise money for her friend Tony who is out of work and needs surgery. 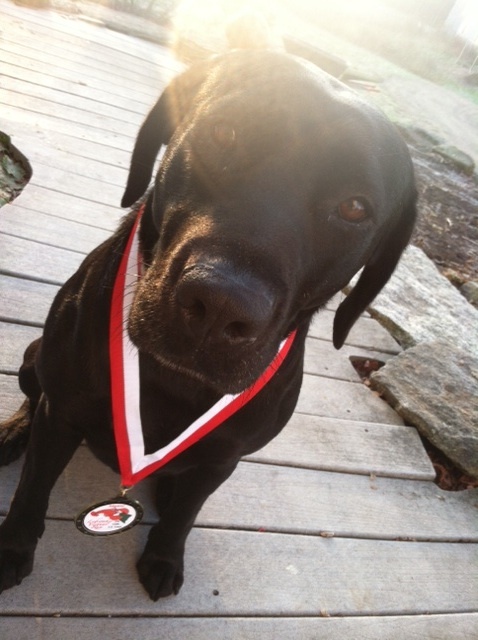 I did my virtual race for Louise and Tony last weekend with Pepper and decided that Pepper definitely earned the medal. Yes, that's right, you get an awesome Lobstah medal as well! While I haven't officially signed up for any road races for the months of November and December, you can see that I've been busy and have a full line up with these fabulous virtual races. All of them are put together for excellent reasons and I can fit them in to my schedule when it works. Even better for this crazy busy mom! What virtual races are you doing? Share here & be sure to add the link. Thank you for sharing all these virtual races. I'm shooting for the New Year's one. I've been on crutches for over a month now and I'll be starting PT next month. Would LOVE to be able to walk any distance by 1/1/13! Thanks for the advertising Jen! The more the merrier! Hopefully we can figure out your awesome Blogging "free prize" tricks and eventually have some giveaways. Maybe do certificates and or random drawings with participants. So much we want to do with this!! Thanks for sharing all of these! I've added some of them to my post for tomorrow and I'll be sure to link to this post so people can read about more options that are out there. Thanks for the reminder!!! I need to get signed up for these!! Great list! I love doing virtual races!